Messier 82 (M82), also known as the Cigar Galaxy, is an edge-on starburst galaxy located in the constellation Ursa Major. The galaxy lies at a distance of 11.4 to 12.4 million light years from Earth and has an apparent magnitude of 8.41. It has the designation NGC 3034 in the New General Catalogue. The Cigar Galaxy occupies an area of 11.2 by 4.3 arc minutes of apparent sky, which corresponds to a linear diameter of about 37,000 light years. 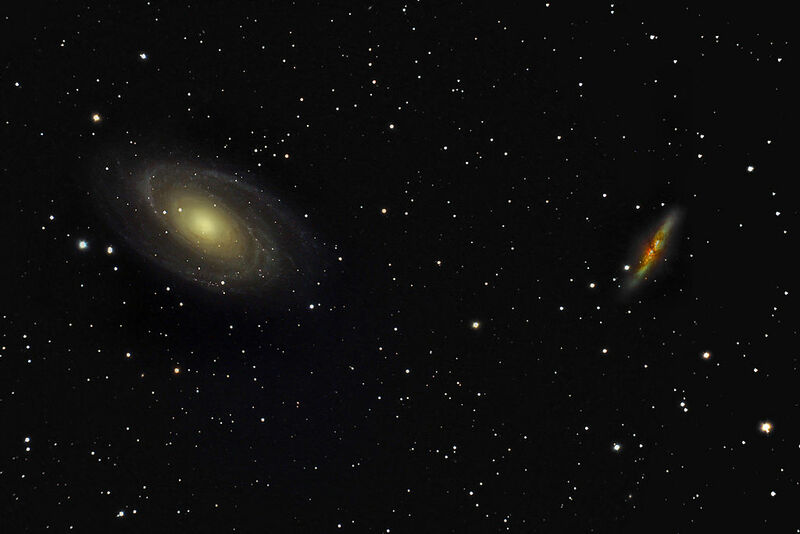 In small telescopes, it forms an impressive pair with its larger neighbour, Bode’s Galaxy (M81), which appears face-on and lies only 38 arc minutes from M82. 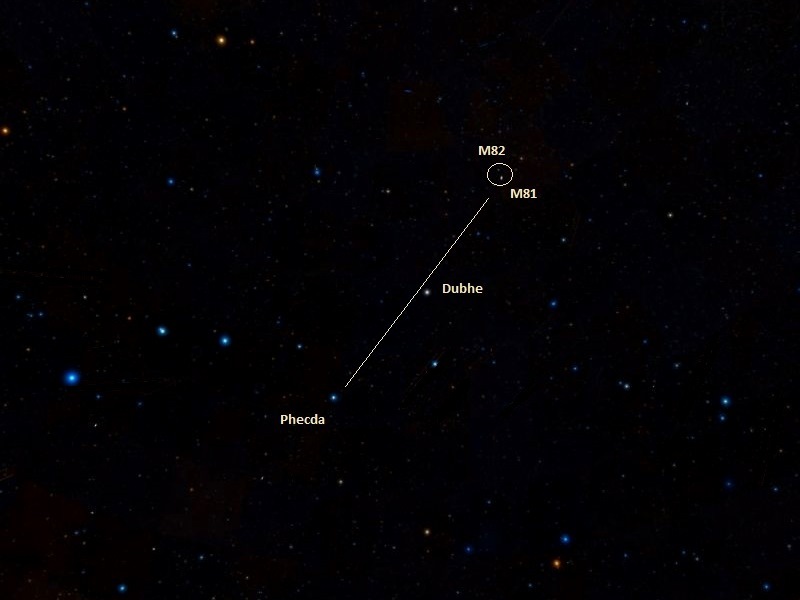 Messier 82 can be found about 10 degrees northwest of Dubhe, Alpha Ursae Majoris, the star that marks the northwestern corner of the Big Dipper‘s bowl. A line drawn from Phecda, Gamma Ursae Majoris, to Dubhe and extended by the same distance leads to the M81/M82 pair. M81 is located 38 arc minutes south of M82. In binoculars and small telescopes, the Cigar Galaxy appears as a thin rod of light, while 6-inch and 8-inch telescopes reveal the bright core and dark patches across the galaxy’s surface. Larger instruments show more details of the galaxy’s structure. 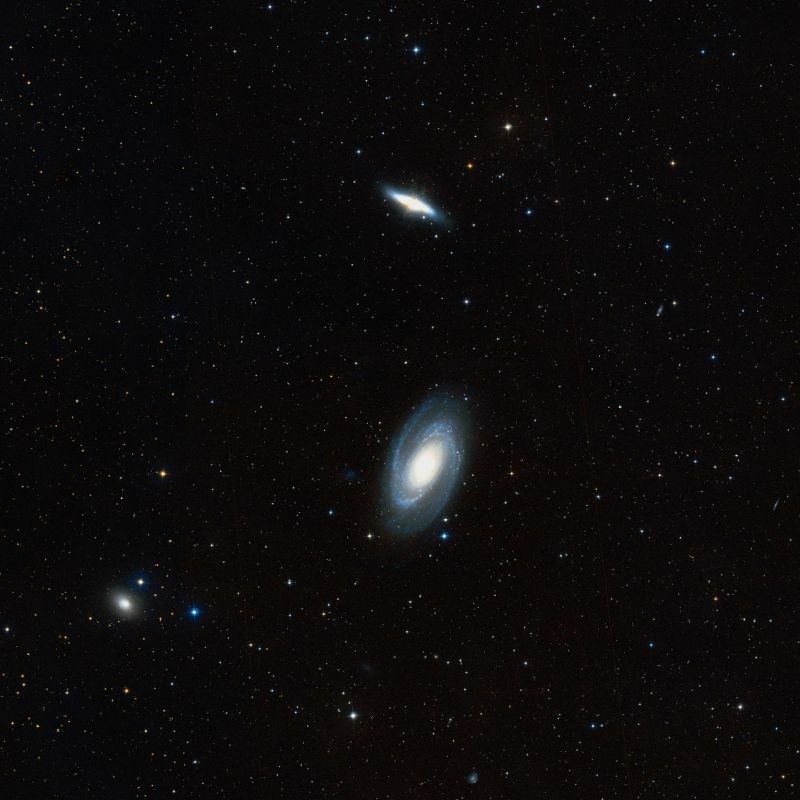 The best time of year to observe M81 and M82 is during the spring. 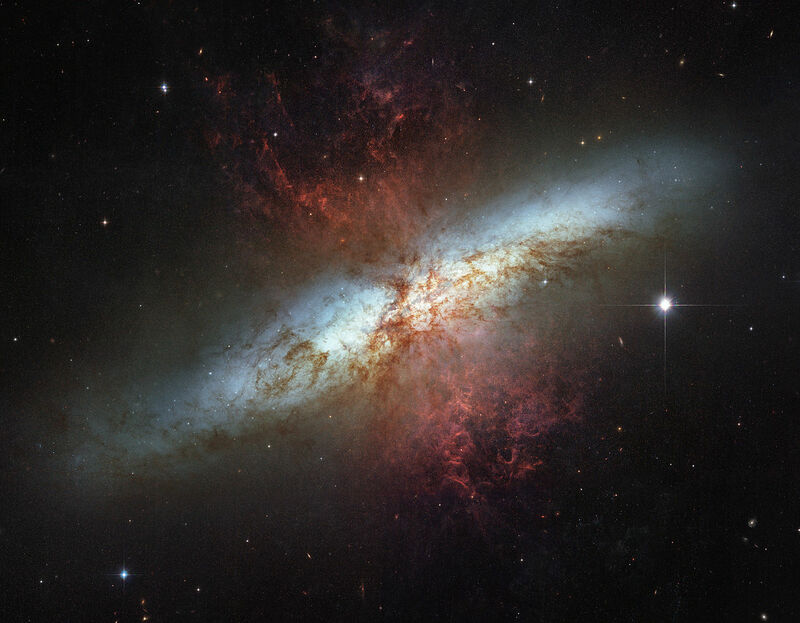 To celebrate the Hubble Space Telescope’s 16 years of success, the two space agencies involved in the project, NASA and the European Space Agency (ESA), are releasing this image of the magnificent starburst galaxy, Messier 82 (M82). This mosaic image is the sharpest wide-angle view ever obtained of M82. The galaxy is remarkable for its bright blue disk, webs of shredded clouds, and fiery-looking plumes of glowing hydrogen blasting out of its central regions. Throughout the galaxy’s center, young stars are being born 10 times faster than they are inside our entire Milky Way Galaxy. The resulting huge concentration of young stars carved into the gas and dust at the galaxy’s center. The fierce galactic superwind generated from these stars compresses enough gas to make millions of more stars. In M82, young stars are crammed into tiny but massive star clusters. These, in turn, congregate by the dozens to make the bright patches, or “starburst clumps,” in the central parts of M82. The clusters in the clumps can only be distinguished in the sharp Hubble images. Most of the pale, white objects sprinkled around the body of M82 that look like fuzzy stars are actually individual star clusters about 20 light-years across and contain up to a million stars. The rapid rate of star formation in this galaxy eventually will be self-limiting. When star formation becomes too vigorous, it will consume or destroy the material needed to make more stars. The starburst then will subside, probably in a few tens of millions of years. Messier 82 is about five times more luminous than our galaxy, the Milky Way, and about 100 times more luminous than the Milky Way’s centre. It is the closest starburst galaxy to Earth and serves as a prototype for this type of galaxy. M82 is one of the smallest galaxies listed in the Messier catalogue and inclined about 80 degrees to our view. The galaxy’s edge-on appearance has earned it the name Cigar. The galaxy is receding from us at 203 km/s. The Cigar Galaxy was long believed to be an irregular galaxy. However, near-infrared observations in 2005 revealed two symmetric trailing spiral arms in the galaxy. The high surface brightness of the galaxy’s disk and our edge-on view of M82 are the main reasons why the spiral arms had not been detected sooner. M82 is usually classified as irregular, but is probably a distorted disk galaxy and a striking prototype of a class of starburst galaxies. The star forming activity in M82 is caused by the galaxy’s interaction with its large neighbour, Bode’s Galaxy (M81), the central galaxy in the M81 Group, which also includes M82 and dozens of other galaxies in Ursa Major. The centres of the Cigar Galaxy and Bode’s Galaxy are visually separated by approximately 130,000 light years. 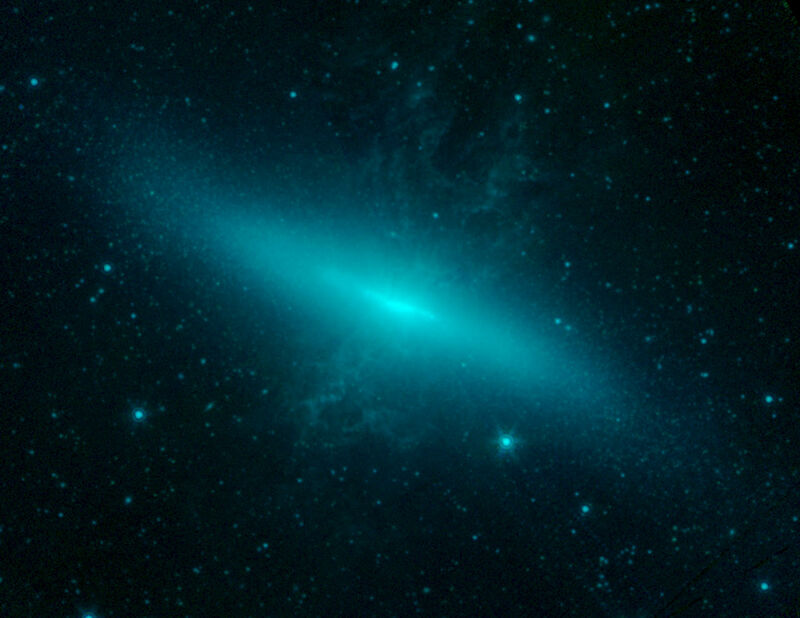 The Cigar Galaxy is strongly affected by the interaction with M81, with tidal forces deforming the galaxy in a process that started some 100 million years ago. 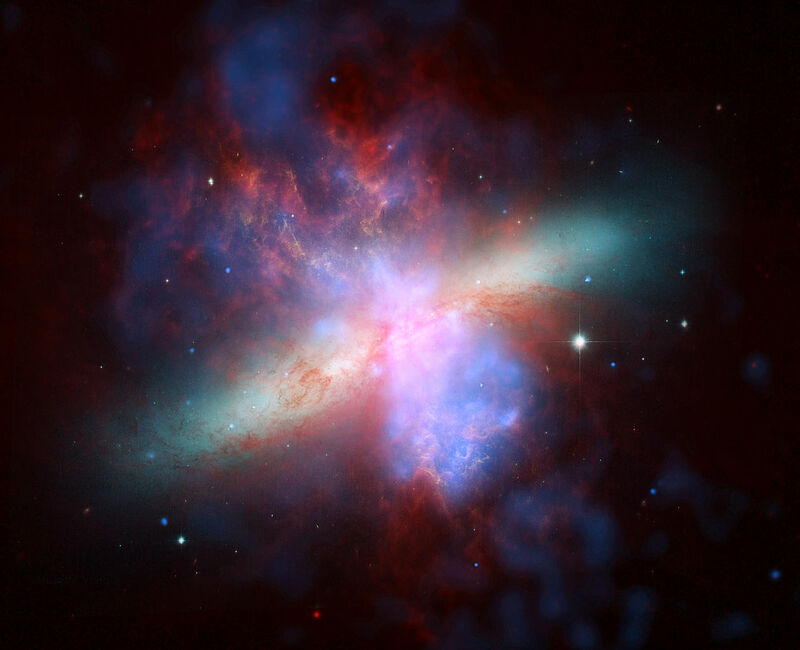 As a result of the encounter, star forming activity in M82 has increased tenfold compared to other galaxies. This image shows the most detailed view ever of the core of Messier 82 (M 82), also known as the Cigar Galaxy. Rich with dust, young stars and glowing gas, M 82 is both unusually bright and relatively close to Earth. The starburst galaxy is located around 12 million light-years away in the constellation of Ursa Major (The Great Bear). This is not the first time Hubble has imaged the Cigar Galaxy. Previous images (for example heic0604) show a galaxy ablaze with stars. Yet this image looks quite unlike them, and is dominated instead by glowing gas and dust, with the stars almost invisible. Why such a difference? The new image is more detailed than previous Hubble observations – in fact, it is the most detailed image ever made of this galaxy. But the reason it looks so dramatically different is down to the choices astronomers make when designing their observations. Hubble’s cameras do not see in colour: they are sensitive to a broad range of wavelengths which they image only in greyscale. Colour pictures can be constructed by passing the light through different coloured filters and combining the resulting images, but the choice of filters makes a big difference to the end result. Using filters which allow through relatively broad bands of colours, similar to those our eyes see, results in natural-looking colours and bright stars, as starlight shines brightly across the spectrum. Images taken by the Hubble Space Telescope in 2005 revealed 197 massive clusters of young stars in the core of M82. The clusters have an average mass of about 200,000 solar masses. The rate of star formation in the galaxy’s core is about 10 times faster than that in our entire galaxy and the active starburst region occupies an area that is 500 parsecs in diameter. The core of M82 is a strong source of radio emissions. 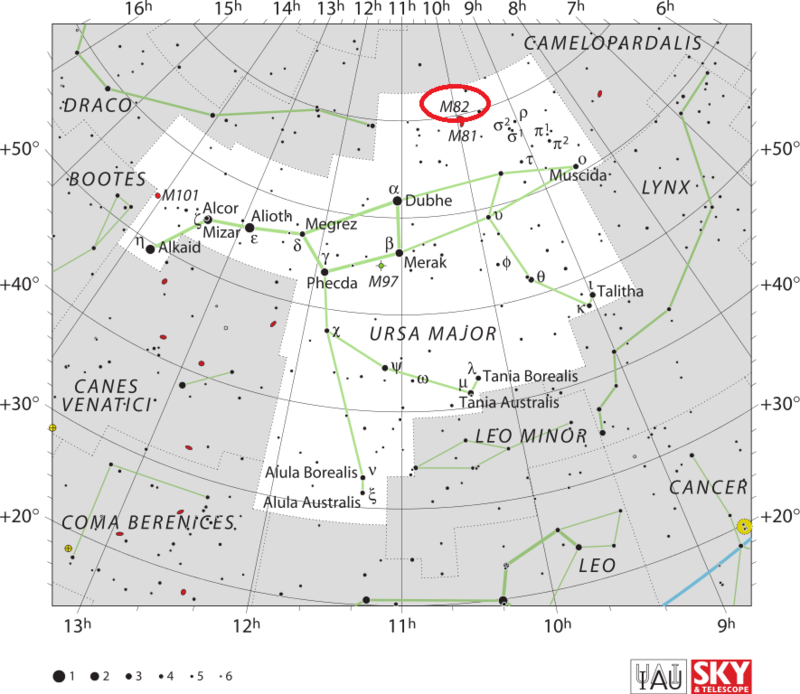 Originally named Ursa Major A, the radio source is now known as 3C 231. It is the strongest source of radio emissions in Ursa Major. The Cigar Galaxy is the brightest galaxy in the sky in infrared wavelengths. It shows an infrared excess, which is to say, it is significantly brighter in infrared than in visible light. Other galaxies that share this characteristic include Centaurus A, a bright peculiar galaxy located in the constellation Centaurus, and NGC 5195, the companion of Messier 51 (Whirlpool Galaxy). The stars in the Cigar Galaxy’s disk appear to have formed about 500 million years ago and are found in more than 100 clusters similar to globulars but younger. Star forming activity in the disk stopped about 100 million years ago and there is no evidence of star formation occurring anywhere outside the central starburst region. Star formation in the halo has been low for the last billion years. This indicates that the Cigar Galaxy was a low surface brightness galaxy before its encounter with M81, which triggered a burst of star formation. The supermassive black hole at the centre of M82 has a mass of about 30 million solar masses. The first intermediate-mass black hole candidate, with an estimated mass of 200 to 5,000 solar masses, was detected by the Chandra X-ray Observatory about 600 light years from the centre of the Cigar Galaxy. This image shows the core of galaxy Messier 82 (M82), where two ultraluminous X-ray sources, or ULXs, reside (X-1 and X-2). ULXs are regions that shine intensely with X-rays. Astronomers previously believed that all ULXs were the result of actively feeding black holes; as the black holes pull matter onto them from companion stars, the matter heats up and blazes with X-rays. X-2 is the largest point of light in the pink field, while X-1 is the large point to the right of X-2 (see annotations on the image). NuSTAR has added a new twist to the mystery of ULXs by showing that one of the ULXs in M82, called M82 X-2, is not a black hole but a pulsar. The observatory’s high-energy X-ray observations caught a telltale pulse of X-rays coming from the object. A pulsar is a leftover core of an exploded star that sends out rotating beams of high-energy radiation. Pulsars are not as massive as black holes, so researchers are confounded by the immense amount of radiation pouring out of this relatively puny, compact object. Meanwhile, other researchers, using data from NASA’s Rossi X-ray Timing Explorer, recently found evidence that the other ULX in M82, called M82 X-1, is indeed a black hole. They think it might belong to a long-sought intermediate-mass class — a missing link between smaller, stellar-mass black holes and the gargantuan ones that dominate the centers of most galaxies. Together, these results suggest that ULXs may be more diverse than once believed. The image is a combination of high-energy X-ray data taken by NuSTAR (pink) and lower-energy X-rays captured by NASA’s Chandra X-ray Observatory (blue). Image: NASA/JPL-Caltech/SAO. 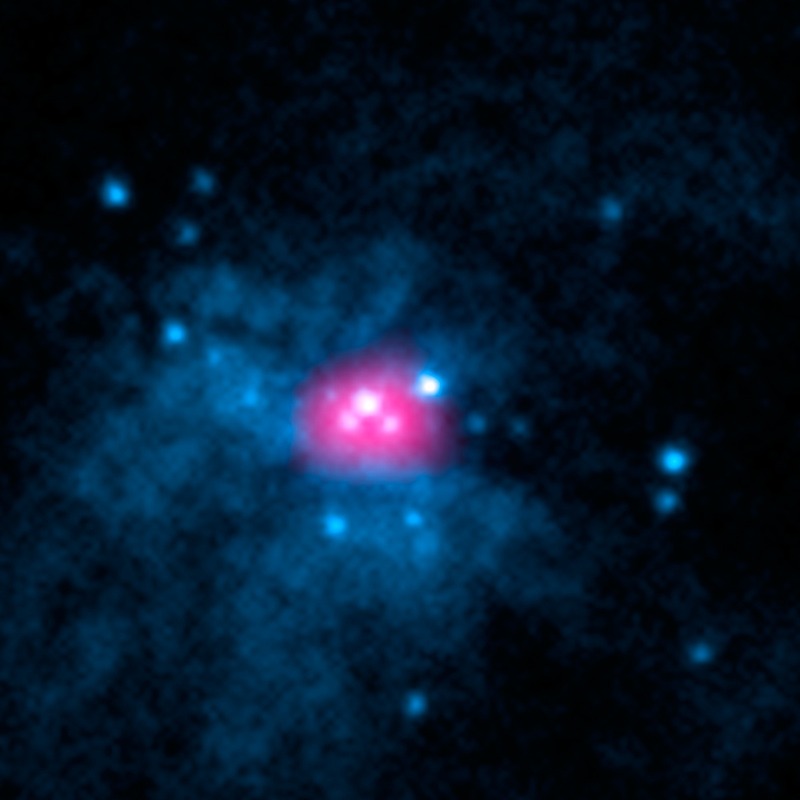 High energy X-rays (pink): NuStar. 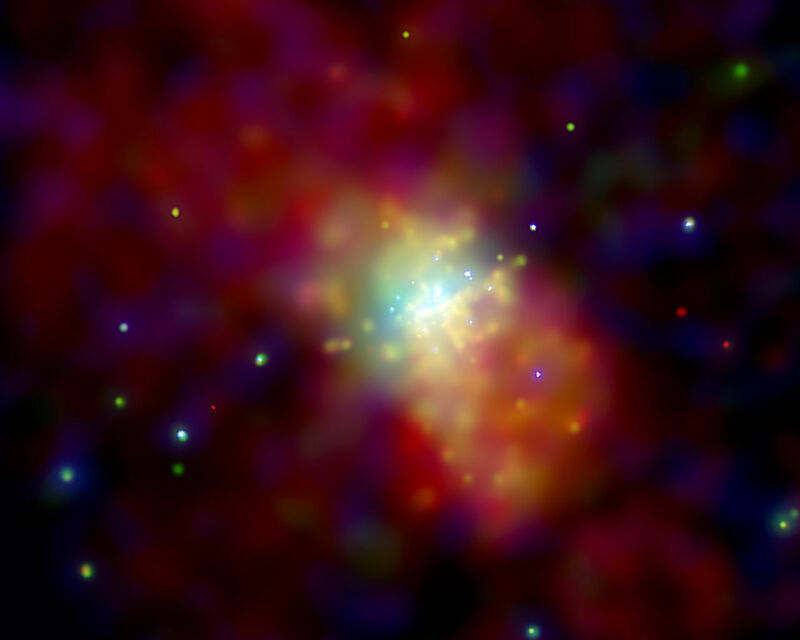 Low energy X-rays (blue): Chandra X-ray Observatory. 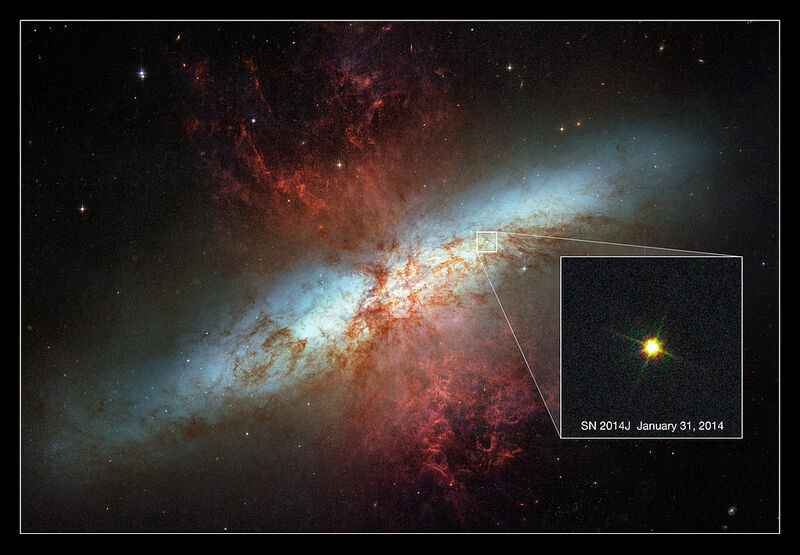 In 2014, the brightest pulsar known was discovered in M82. Pulsars are dense remnants of stars that ended their life in supernova explosions. The pulsar in M82 was given the designation M82 X-2. Its luminosity is 100 times greater than its mass should be able to produce, in theory. The pulsar is classified as an ultraluminous X-ray source (ULX). A Type Ia supernova, named SN 2014J, was detected in the Cigar Galaxy on January 21, 2014. At the time of discovery, the supernova had an apparent magnitude of 11.7. By January 23, it brightened to 10.9. Spiral galaxy Messier 82 has long been known for its remarkable starburst activity, caused by interactions with its near neighbour Messier 81, and has been the subject of intense study for many years. On 21 January 2014, astronomers at the University of London Observatory in London, UK, pointed their telescope at the galaxy and spied something peculiar… an intensely bright spot seemed to have suddenly appeared within the galaxy. This bright spot is actually a new supernova known as SN 2014J — the closest supernova to Earth in recent decades! Since its discovery, SN 2014J has been confirmed as a type Ia supernova, making it the closest of its type to Earth in over 40 years (since SN 1972E) . This new NASA/ESA Hubble Space Telescope image is set against a previous mosaic of Messier 82 from 2006 (heic0604a), and shows the supernova as an intensely bright spot towards the bottom right of the frame. Type Ia supernovae are even more exciting for astronomers, as they have particular properties that we can use to probe the distant Universe. They are used as standard candles to measure distances and help us understand the scale of the cosmos. Catching such a supernova so soon after its explosion is very unusual; this early discovery will enable astronomers to explore its evolution in great detail, and to potentially infer the properties of its progenitor star. Messier 82 is several times more luminous than our Milky Way. Because it is only 12 million light-years away, it is one of the brighter galaxies in the northern sky. It can be found in the constellation of Ursa Major (The Great Bear). The supernova is currently visible through a modest amateur telescope, so why not see if you can spot it from your back garden? The image shown here was taken on 31 January 2014 with Hubble’s Wide Field Camera 3. This image is inset into a photo mosaic of the entire galaxy taken in 2006 with Hubble’s Advanced Camera for Surveys. New supernova image: NASA, ESA, A. Goobar (Stockholm University), and Hubble Heritage. 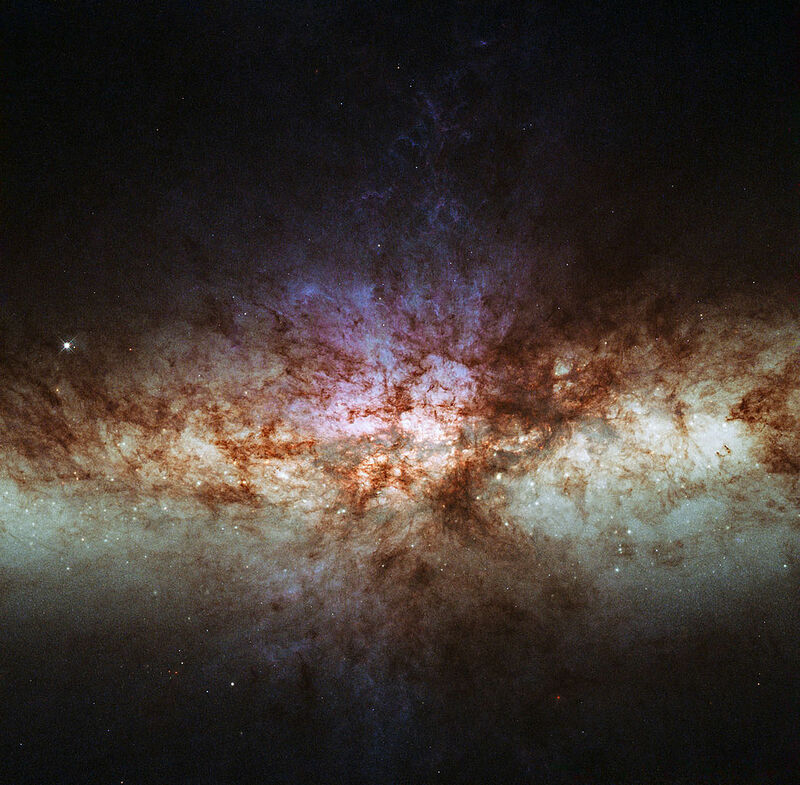 Image of Messier 82: NASA, ESA and the Hubble Heritage Team STScI/AURA). Acknowledgment: J. Gallagher (University of Wisconsin), M. Mountain (STScI) and P. Puxley (NSF). SN 2014J was classified as a Type Ia supernova. It was one of the nearest supernova events observed in the last several decades. SN 1993J, observed in the nearby Bode’s Galaxy, occurred at a similar distance, and SN 1987A, seen in the Tarantula Nebula, in the Large Magellanic Cloud, in the constellation Dorado, was considerably closer. SN 2014J was the closest Type Ia supernova since SN 1972E, detected in the irregular galaxy NGC 5253, located in the constellation Centaurus, on May 13, 1972. Several other probable supernovae were discovered in M82: SN 2004am (type II), SN 2008iz (type II) and another possible supernova reported in June 2009. An unknown object in M82 was reported by radio astronomers at the Jodrell Bank Observatory of the University of Manchester in April 2010. The radio waves emitted by the object did not look like anything ever detected before and the source of the emissions is still uncertain. There have been several theories about the identity of the source, but none of them match the data. One of the theories suggested that it was an unusual microquasar, but this is unlikely because the object’s X-ray emissions are below the threshold for a microquasar. The object was detected several arc seconds from the galaxy’s centre and is not likely to be associated with the central black hole in M82. It has a high apparent superluminal motion, four times the speed of light relative to the centre of M82, which is consistent with relativistic jets in supermassive black holes, but does not mean that the unknown object itself is moving faster than the speed of light. On December 31, I found through the seven-foot telescope, closely above the head of UMa, east near the star d at its ear, two small nebulous patches separated by about 0.75 degrees, the positions of which relative to the neighbored small stars are shown in the tenth figure. The patch Alpha [M81] appears mostly round and has a dense nucleus in the middle. The other, Beta [M82], on the other hand, is very pale and of elongated shape. I could determine the separation of Alpha to d as 2deg 7′, to Rho as 5deg 2′ and to 2 Sigma as 4deg 32′ with some accuracy; Beta was too faint and disappeared from my eyes as soon as I shifted apart the halves of the objective glass. Nebula without star, near the preceding [Messier 81]; both are appearing in the same field of the telescope, this one is less distinct than the preceding; its light faint & elongated: at its extremity is a telescopic star. Seen at Berlin, by M. Bode, on December 31, 1774, & by M. Méchain in the month August 1779. No. 81 is a fine bright oval nebula, of a white colour, in the Great Bear‘s ear, which was first registered by M. Messier in 1781, and exhibited a mottled nebulosity to WH [William Herschel]. Its major axis lies np [north preceding, NW] to sf [south following, SE]; and it certainly is brightest in the middle. There are several minute companions [stars] in the field, of which a close double star in the sp [south preceding, SW] quadrant is No. 1386 in Struve’s grand Catalogue, and by him marked vicinae; the members are both of 9th magnitude, and trend np [north preceding, NW] to sf [south following, SE], about 2″ apart, forming a fine though difficult object. With a low power, No. 82 M. can be brought into the north part of the same field of view, although they are half a degree apart. It is very long, narrow, and bright, especially at its northern limb, but rather paler than No. 81. A line drawn through three stars in the sp [south preceding, SW] to a fourth in the nf [north following, NE] passes directly through the nebula. The two nebulae precede Lambda, in the end of Draco‘s tail, by 25deg, but as the vicinity is deficient of large stars, they are not readily fished up. The apparent place here taken, is that of a small star between the two nebulae, which was differentiated with 29 Ursae Majoris, and every care taken in the reduction. The bright star in the animal’s chest, south of 29, viz. Phi, is pronounced to be double, both companions being of the 5th magnitude, and only half a second asunder. William Parsons, 3rd Earl of Rosse, was the first to note the dark dust lanes in the galaxy’s central region. Halton Arp included M82 in his Atlas of Peculiar Galaxies as Arp 337.